A Chicago Housewifey – If it's FREE, A Chicago Housewifey will tell you about it! Everyone has a sweet tooth or a sweets craving every once in a while. You do not always indulge your craving. However, once in a while, you may want to. Especially, if giving in to your craving comes with discovery, learning and of course, if it is for free! Remember, entrance to the Conservatory is free. It is all the more enjoyable learning about different palms for this reason. Have you heard of Lady Fern? This type of fern makes frequent appearances in Illinois. 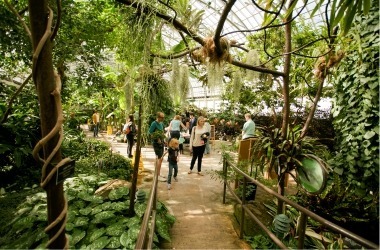 For this reason, the Conservatory dedicated a room for lush ferns and rocky outcroppings. This is to showcase what prehistoric Chicago might have looked like. If you are a native of Chicago or the surrounding suburbs, wouldn’t you love to learn about what the Chicago looked like a long time ago? The best part of it is, it is for free! The ability of plants to photosynthesize makes them big heroes in our world. Do you want to talk about this with your little ones for free? Come to this exhibit and have fun learning. Are you planning a valentine outing in advance? The Conservatory is a good place to visit! Since entrance to this wonderful place is for free, you do not even need to worry about your budget. Make sure you make a donation at the entrance, though. Your donation will keep making this place enjoyable for a lot of Chicago residents and visitors! Sweet Saturday event is from noon to 3 P.M. You will be treated to sweet treats like chocolates, vanilla, banana and papaya. Children will also get to enjoy crafts activities like leaf rubbing and paper flowers! I’ve always loved IHOP. It has a special place in my heart. Unfortunately, not all IHOP branches have a good reputation. On the other hand, the IHOP in Norridge impressed me on our visit. On entering the place, I was surprised by how much space they have and the lighting is great! Unlike another IHOP place nearby, this one is well lit and the open space gives a warm and welcoming feeling. Since it is the holiday season, this IHOP is also decorated for the season. Their decorations were simple and did not crowd the restaurant at all. I inspected everything. I had to. I checked all the napkins, I looked at the floor under the table. I made sure the chair was clean. I even went to the bathroom and was satisfied by the cleanliness. I gave each a thumbs up. Of course, if you are a Chicagohousewifey, you’ll be looking for freebies or deals and guess what? Kids eat free on weekdays from 4pm with a purchase of one adult meal. A good deal!